In all, 140 men and one nursing sister appear on the memorial plaque of what was then MacKay Presbyterian Church. Nineteen gave their lives. This is an astonishing record of service given the size of the church and the community but it is by no means unique in Canada. Why had these men joined up? What did they believe they were fighting for? How did the families and the community handle the stress of having so many of their sons away in a seemingly endless conflict? Telling the life story of each soldier and his family, against the backdrop of a church and community at war, could be a small but useful contribution to the social history of the Great War. Of course, the research quickly became a rabbit hole and involved a widening range of sources. Besides service records and other information on soldiers available online, including the Commonwealth War Graves Commission, I used ancestry.ca to access documentary records such as birth, death, census, voters’ and immigration records, online newspapers, records of the nearby Beechwood cemetery, city directories, and other sources to flesh out family stories; and I had church records including communion rolls and the minutes of the Session, the Trustees, and the Ladies’ Aid. Websites such as the Canadian Virtual War Memorial, the Canadian Expeditionary Force Study Group, and others have been invaluable and one cannot speak highly enough of the gifted and dedicated amateurs who are delving into the records of regiments and people. For each of the fallen there were also specific sources such as regimental histories, war diaries, and other information, and in some cases, I have been able to contact family members who kindly provided information and pictures. Each story was fascinating and all took me in unexpected directions. Of the nineteen, twelve were infantry, three artillery, two RFC, one with the Borden Motor Machine Gun Battery, and one who served in Egypt with the British Army Service Corps. The first to fall died near Ypres in the autumn of 1915; the last, a TB patient, was a victim of the influenza epidemic a few days before the end of the war. Together, their stories engage much of the history of the CEF and much of the social history of their community. My wife and I visited all the cemeteries where they are buried, or in the case of four who have no known graves, the memorials where their names appear. But many of the most moving stories were those of the families who in some cases had several sons at war. The more one learns, the more elusive the subjects become. It is my hope in placing some of this work-in-progress on a blog that some readers may be able to provide further ideas or relevant information. To begin this exercise I have prepared a series of blogs which tell the story of the Stalker family: Robert, who was killed at Vimy Ridge, his children and a fight for their custody between their grandmother and his second wife, two brothers who also served, the widowed mother who watched and waited, and the other members of the Stalker family including four sisters whose early death from TB is as much a social commentary as is the story of the men. But first, to set the stage, some background on the community and the church. New Edinburgh is a community within the city of Ottawa between the Rideau River where it empties into the Ottawa River and Rideau Hall. It was founded by Thomas McKay, who used his fortune from building locks on the Rideau Canal to purchase 1100 acres of land, built flour, grist, lumber and textile mills at the Rideau falls, was a partner in the Ottawa and Prescott Railway to ship his lumber to the United States, and many other enterprises. The village was laid out to house his workers, many from Scotland, and he built Rideau Hall as his own residence. When he died in 1855 he left many debts which his son-in-law John MacKinnon (for whom he built Earnscliffe) proved unable to manage. When MacKinnon died the estate was managed by another son-in-law, Thomas Coltrin Keefer, a pioneer engineer and entrepreneur. Keefer sold off some land, many business assets including the railway and the mills (which eventually became the W. C. Edwards lumber company), Earnscliffe, and Rideau Hall to the Government of Canada as the residence of the Governor-General. He aggressively developed New Edinburgh and laid out Rockcliffe as a pioneer urban parkland village. 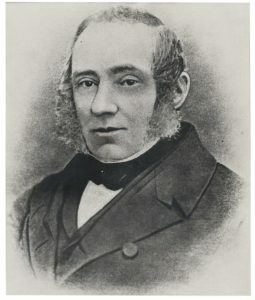 Thomas McKay. Source: Dictionary of Canadian Biography. In 1867 New Edinburgh was incorporated as a village and in 1888 it was annexed to the city of Ottawa. Many of the houses were built for workers in the sawmills, the railway, the Ottawa Street Railway, and other small industries in the area, but with the growth of Ottawa as the capital of a transcontinental Dominion and its proximity to Rideau Hall, New Edinburgh was increasingly home to civil servants as well as a few wealthy professionals and entrepreneurs. Immigration also swelled its population so that by 1914 it had about 2000 people and was sprawling beyond its original boundaries. A raw, rather unhealthy place subject to periodic floods at the turn of the century, New Edinburgh by the Great War had street lights, some paved streets and sidewalks, sewers, a street railway, flood control, schools and athletic facilities including a rowing club, and the pleasant ambience of village life within a city – but it still had an appalling rate of childhood mortality. It was a diverse community of Scots and Anglo-Saxons with a large influx of Germans, a place with large families and crowded houses, and a substantial number of men of military age. Thomas McKay had been a staunch Presbyterian and following the union of the Presbyterian churches in Canada in 1875, his grandson, William Alexander MacKinnon, took the lead in establishing a church on land from the McKay estate, and other members of the family donated a manse. From some 32 members at its founding, the congregation had grown big enough by 1910 to replace its original Sanctuary with the charming arts-and-crafts structure that stands today. 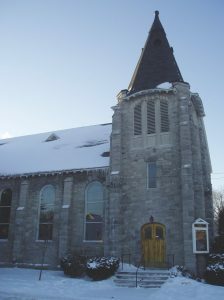 Under Dr. Peter William Anderson, who was minister between 1904 and 1934, the church prospered with a large Sunday School, missionary societies, young peoples’ clubs, a ladies’ aid, a strong athletic life that included a championship hockey team, and a vibrant community life including amateur theatricals produced by the minister’s wife. A leading lawyer recalled that he joined the church in 1916 because “I decided that here was an excellent example of a Union Church because its members were originally of practically all shades of Protestant beliefs with the good old Scottish Presbyterians predominating of course, and leavening the whole.” In 1925 the congregation voted overwhelmingly to join the United Church of Canada. MacKay Presbyterian, like its parent denomination, strongly believed in the justice of the war. The Ladies’ Aid rolled bandages, knit socks, and raised money for their sons overseas. And the church supported the soldiers with their prayers. There were few families in the congregation by 1916 that did not have one or more sons (and one daughter) serving overseas, including Robert Stalker and his two brothers. It is to their story that we turn to next.